Around 1780, the London 'musical emporium' of Longman & Broderip (later bought by a consortium headed by Clementi after both partners were declared bankrupt, despite the firm's huge success, in 1795) issued "Book IV" in a series for organ, entitled "Twelve Voluntaries and Fugues for the Organ or Harpsichord with rules for tuning by the celebrated Mr Handel". Clearly, only the unwary were likely to fall for the simple device of implying that the music was by Handel, but equally clearly L & B were hoping to benefit from such naivety. 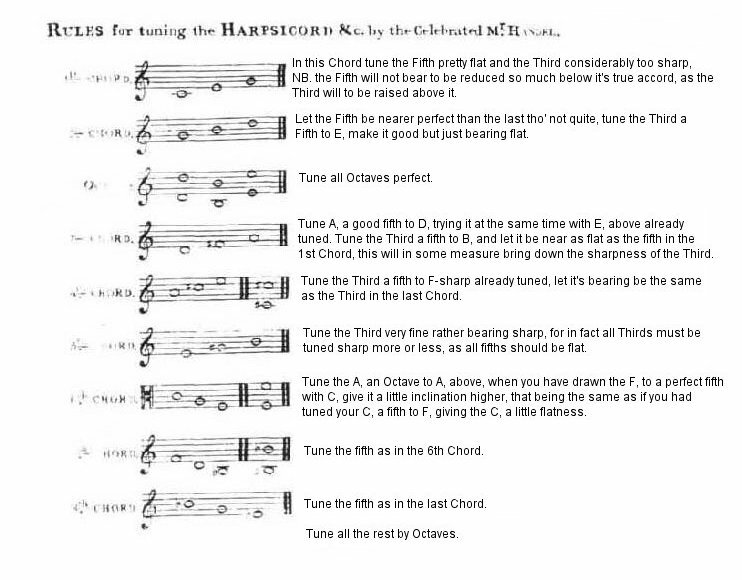 Inside the book, the tuning rules are given pride of place at the front (most unusual in itself), and once again attributed to Handel. My feeling is that they were aiming at two markets, and wished to disappoint neither; in other words, the music was aimed at the general public, and if they cared to think it was by Handel, well so much the better - meanwhile, serious musicians would understand the need to 'wrap' the tuning rules in some notes (impossible to sell them separately), no doubt the best available, and would know what they were buying. The psychology here implies to me at least, that L & B themselves believed the rules to be genuine (and as being prepared to inlay their own names on instruments made by others for them, I would argue that they were perhaps *best placed of all* to judge 'just how much can be got away with'. Their firm's inability to pay its creditors seems to have had much more to do with the ongoing war with France, than through any fault of their own). Here's a sample of Jorgensen's enthusiasm for the Handel temperament (from his 800-page tome published by Michigan State University Press in 1991): "The ease of tuning is not the only indication that the Handel temperament was composed by a master. By comparing [seven other given temperaments], one can see that whoever authored the Handel Temperament had more understanding of classical harmonic balance than had anyone else before 1780." Rather than print the scale for a single base pitch, may I recommend the excellent Scala program, which includes the above temperament in its comprehensive library.